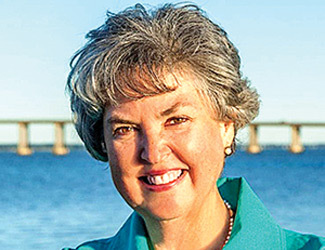 “The Downing Bridge in the background has symbolized connection for the Middle Peninsula and Northern Neck for generations. Our bridges connect us to commerce and trade, jobs, education, healthcare, friends and family,” said Dr. Elizabeth Crowther. 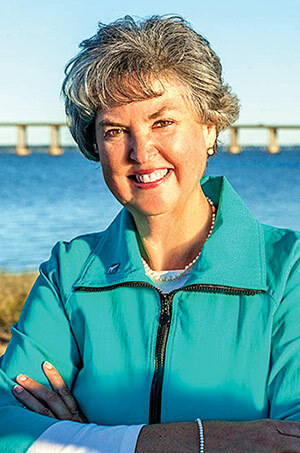 WARSAW—After 14 years as Rappahannock Community College’s president, Elizabeth “Sissy” Crowther on November 29 announced her intention to retire. “Welcoming change has allowed RCC to transform into a nationally recognized model for rural higher education. And because I feel change makes us stronger, it is easier to tell you that I will retire June 30, 2019,” said Dr. Crowther. “Since 2004, it has been my pleasure and privilege to help craft an RCC that is truthful to its founders’ values, and yet has grown to become recognized regionally, statewide, and nationally for its programs, services and role in regional economic and community development,” she said. Dr. Crowther accentuated the positive timing of her retirement and transitioning to a new RCC president.